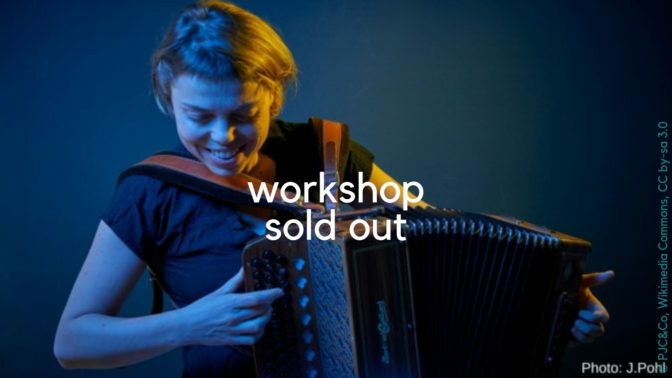 Anne Niepold (Belgium) is an extraordinary accordionist and composer. She is also an enthusiastic and inspirational teacher with a great sense of fun! This week offers an opportunity for melodeon players (D/G) of an intermediate level and above to explore what it takes to become a better player, and a better musician too. The course is not repertoire based, you won’t be learning dozens of tunes; instead you’ll be using one or two tunes as the starting point from which to discover new ways to interpret and play, using improvisation, composition, playing together in large and small groups, creating accompaniments and arrangements. This course is aimed at intermediate and advanced level players of the D/G melodeon. You’ll need to have a good command of your instrument, be open to trying new things, and be prepared to work hard – it will be intensive but also an enjoyable and rewarding week! Anne Niepold studied in the jazz department of the Royal Conservatory of Brussels and attended many courses and masterclasses. As a performer she is a true force of nature – brash, adventurous and phenomenally skilled, she takes the humble accordion in startling directions. Beside her solo projects, she performs with numerous arts companies at home and abroad, and has numerous recordings to her name.